It all sounds great! But how do I know my child will be safe? What do you actually do on the program? How come parents can't come too? Are my kids the right age? What about teens? I'm finding my kids a real handful at the moment! Could ReWilding help? My kid has Attention Deficit Disorder/Asperger's/Oppositional Defiant Disorder/Dyslexia..
Do you run rites of passage? What do we do while our kids are off having fun? Why would I want my child to be any more wild than they already are?! The safety and well-being of the children under our care is our primary concern - full stop. The Bluegum Team brings over a decade of experience on outdoor youth programs, training in expedition leadership and wilderness First Aid and countless hours leading groups of all ages in the bush. All our mentors are thoroughly trained and qualified and supported by a rigorous Risk Management policy that is continuously evaluated. The team leader is a counsellor and psychotherapist specialising in young people. We always make sure we have an excellent mentor to participant ratio; typically 1 mentor for every 4 or 5 kids. This is far in excess of most outdoor programs (1 to 15 is generally considered ample). We have full insurance coverage and a child protection policy that does what it says: protects your child. As parents ourselves we appreciate that you are entrusting your kids to our care, and we do everything we can to honour that trust, and to look after your kids as we would our own. If you have any further questions about any of this, just call us for a chat. That's a good question, and the answer is that it depends. Since we have so many incredible locations available to us, we choose according to what the needs of the group are, and what the weather is up to. We may run activities on our bush property, or we may explore nearby wilderness areas such Booderee or Morton National Park. We may be at the beach, tracking bandicoots and possums, or we may be in the bush, going for day walks and visiting some of the many special spots the area has to offer. Broadly speaking, we use bushcraft activities (eg building shelters, finding bush foods and making fire), nature awareness (eg animal tracking, bird language, plant identification) and storytelling. The emphasis is very much on learning by doing, and on teaching without overtly teaching. For more of an idea of what your kids can expect, have a look at the 'Gallery' section. It's only fairly recently in our evolutionary history that we humans have expected only one pair of adults to do all the work of raising a child. As every parent can attest to, it's a lot to ask! This program is opportunity for you to share the responsibility for your child's growth and well-being. Parents don't come on the day activities for the same reason that we don't bring i-pods or i-phones. Time in the bush is time for children to expand into who they are, independent of the external influences that define them during normal life. It's hard for our children not to fall back into old patterns when we're around, it's as simple as that. And having time apart means they have so much they are just bursting to share with you when they come back each afternoon. See our 'Adults' section for more info on our adult mentoring program. We take younger kids (5 - 6 years old) on the ReWild Your Child program, as long as they are ready to spend the day away from their parents, in the bush. Activities can easily be adjusted according to the developmental needs of each age. If the kids are up for it, so are we. Older kids are fine too, all the way up to teens. 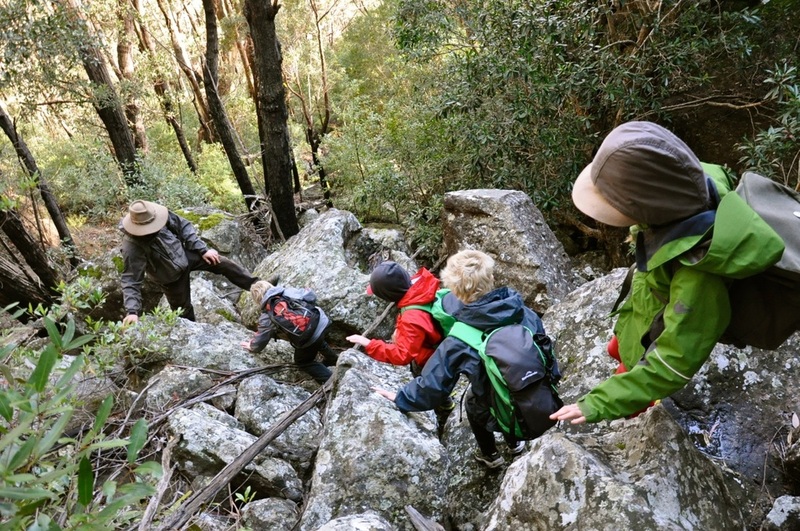 We run the ReWild Adventure and ReWild Quest programs for 11 - 16yr olds. We do our best to make sure groups are of similar ages, so whatever age your child is they will generally be with peers. Although we find that having a mix of ages works very well - the older ones naturally slip into mentor-mode and the younger ones are generally stoked to hang out older with kids. With older kids and teens, where appropriate, there may be more emphasis on a formal rite of passage - marking the shift from childhood towards becoming young men and women. There are developmental milestones in every child's life. When children reach a transition period, they can often be a handful, to put it mildly. Parents can find themselves exhausted trying to accommodate their 8 year old's new found sense of adventure and need for freedom. Or their 13 year old's need to test themselves and discover their limits. These changes occur at different times according to each child but when they do occur it can really be beneficial, to both parent and child, for there to be some space in the relationship in order for the transition to occur. This is where a skilled mentor, and time in the bush, can help. My kid has Attention Deficit Disorder/Asperger's/Oppositional Defiant Disorder/Dyslexia. Could ReWilding help? We may not be able to support kids with severe behavioural difficulties - please call us to discuss your child's needs. That said, we find that kids who have a hard time concentrating in the classroom often excel at bushcraft. Kids with ADD, ADHD (and also Asperger's syndrome) often do really well in a natural environment where over-stimulation is less likely and where there are always a multitude of cool things to become absorbed in. 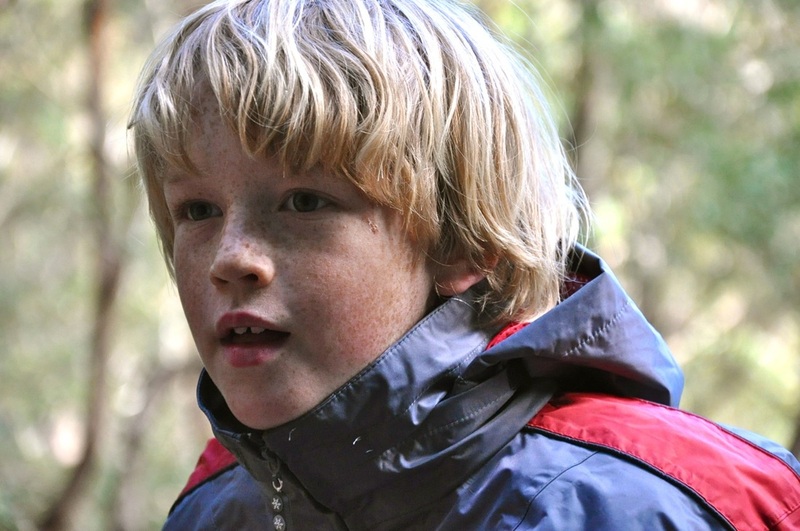 It can be a huge relief for kids who struggle in class (because they aren't able to pursue learning in the manner they require), to find themselves in a supported environment where they discover that success in the bush requires a variety of cognitive styles, and that they have something to offer the 'tribe'. This often leads to transformative experiences for these children, and the memory of thriving in an environment more suited to their needs can be a resource they take away with them. It does mean that re-integration back to daily life can be bumpy at first. But more often than not we hear from parents that the long-term benefits far outweigh the temporary turbulence. We offer re-integration support for all children and parents as part of the program - check-in phone calls or e-mail contact to discuss challenges that may arise. Many people think of a rite of passage being a one-off thing, ie. the shift from childhood to adulthood. We see healthy development as more of a spectrum of maturity, with many rites of passage along the way. (Let's face it, we all move up and down that spectrum to varying degrees, depending the situations we find ourselves in.) For example, for us at Bluegum, learning to make fire with friction is a rite of passage. The journey toward being at home in the wild has many, many threshold crossings and these are never entirely complete. And, ultimately, it's a journey toward being at home in yourself, which is perhaps what maturity is. So, every ReWild program is a rite of passage, in the sense that the participants are moving beyond an old comfort zone, into a new and larger experience of themselves. And, yes, for teens and older kids on our programs (who are instinctively, and often aggressively, pursuing a rite of passage) this often becomes an overt aspect of the ReWilding process. While your kids are ReWilding, you get to do whatever you like! The Jervis Bay area is spectacularly well-provisioned with activities, including bushwalking, snorkelling, scuba-diving, fishing, kayaking, surfing, rock climbing, mountain-biking, among others. For chilling out, there are cafes and shops in Huskisson, and a wealth of stunning white-sand beaches to choose from. It's no wonder it's known as the Jewel of the South Coast. Why would I want my child to be any more wild than they already are? Our programs support young people in their development toward becoming independent, resourceful, skillful and principled, able to act from a place of passion and purpose, rather than reacting to external pressures. Our philosophy is that when a young person's internal authority is nurtured, all else follows; compassion; discernment; responsibility; awareness; everything we want for our young people. That's what we mean by 'wild'.